Watford pick up first win as Belles pick up honours. 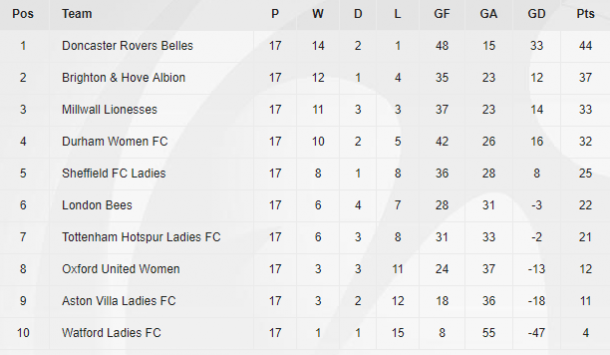 The Belles secured the WSL 2 title with time to spare, a win over Millwall the cherry on top of a strong season as Durham him second-placed Brighton for four and Villa picked up a point at home to Spurs. Elsewhere, the Bees were held by Sheffield and Watford picked up their first win of the season before Sheffield out-muscled Watford in the only midweek clash. With the rain pouring in London, neither the Bees nor Sheffield could find that last bit of quality to find the back of the net. The match was a swinging pendulum from home to away pressure, both with good chances that nine times out of ten would have resulted in a goal but it wasn’t to be for either. The two with little to separate them in the standings finishing deadlocked, with a point to show for a tiring 90 minutes. Sweeping the ball home from close range at a flicked-on corner, Zoe Ness gave the Wildcats the advantage at home eight minutes in before Nicki Gears slipped through the box and knocked the ball through Lucy Gillett’s ankles. The advantage extended after the break when a silky one-two between Emily Roberts and Ness saw the former slot the ball into the far corner and leave no room for a Brighton comeback. The only team who could have denied the Belles the title coming into the match, the Seagulls were soon hit for a fourth when Roberts latched onto a long ball, taking it around Gillett before rolling it home. Asking questions of Aja Aguirre and the home defence at set-pieces, Spurs found their reward five minutes before the break when Jenna Schillaci’s inswinger curled against the far post and cannoned in. With both sides seeing good chances it was a case of missed opportunities for both, the Villainesses able to pull a goal and point back just before the hour when Elisha N’Dow nodded an uncleared corner home. The result enough to keep Villa ninth and Spurs seventh with both able to improve their standing on the last day of the season. Already confirmed as WSL 2 champions after Brighton’s loss earlier in the day, the visitors found themselves on the backfoot in London. Weathering heavy pressure from the Lionesses, the Belles dug in as the hosts fluffed more than one good chance before getting a slice of luck late in the day. After Rhiannon Roberts had seen her effort cleared off of the line, the hosts failed to fully clear the danger and were a goal down when Jade Pennock’s hopeful shot took a wicked deflection to find the bottom corner. Without a win in their first 15 outings this season, the Golden Girls finally found what they had been searching for all term when they came from behind in Oxford. Asking questions from the off, the U’s in their own slum this year claimed first blood when Ellie Noble’s effort bounced off of the bar again in off of Fran Kitching’s back. Though the lead only lasted for two minutes before Helen Ward pulled the visitors level with her first goal of the season, firing low beyond Demi Lambourne. With Kitching in fine form at one end, Watford found the winner just after the hour when Ward’s low ball was turned home at the back post by Simona Petkova, the visitors hanging on to the last to claim all three points. Kept quiet by an in-form Kitching over the first half, the visitors finally found their breakthrough after the break when Hannah Cain dashed up the left before unleashing a low shot into the corner. Pressing the issue, the Yorkshire side came close again before Melissa Johnson grabbed her ninth of the league campaign, picking up a loose ball in midfield before driving it forward and slotting it home. With the match opening up in the lasts ten minutes, Sheffield did well to maintain their advantage, adding a third when Ellie Gilliatt found herself in acres before rocketing one into the top corner from range. All three points secured, the visitors added a late fourth, then fifth, Gilliatt with her second belter of the day before the defender poked Johnson’s square ball home. The glut of goals enough to confirm a fifth-place finish for Sheffield – barring a rash of strange results on the last day.